Every company that makes use of modern field and control engineering has data that could be utilised to monitor things better and improve efficiency. It is worth taking a look at which solution suits which application. Implementation is easier than it looks – even when big data analysis and artificial intelligence come into play. New or modernised process plants should be fun places to work: they are equipped with reliable instrumentation; the latest control engineering makes operation easier; and they feature marking and wireless solutions that mean maintenance and inspection rounds can be documented electronically. Now is the time to take the next step. A functioning, safe plant is a compulsory component. But in the global race for competitive prices, it is the most efficient processes that win the race. Process owners cannot afford to ignore a commodity that they already have access to – tons of data, information and knowledge. Knowledge, if used correctly, can lead to even greater plant efficiency, safety and reliability. Every plant operator is familiar with the problem of installing expensive fieldbus or HART-compatible measuring devices, which constantly provide more data in addition to the actual measured values. But the vast majority of this information is never used – where do you start? Often it helps to get a different, outside perspective. Stephan Sagebiel, head of industry management process technology and engineering at Phoenix Contact, has already been involved in several projects where varying perspectives have provided valuable input. He says that the huge variety of diagnostic information available is not all useful to every user group. Many monitoring solutions simply serve to notify the maintenance team of a malfunction. “But there are some application areas, such as motor monitoring, where the data does not provide the maintenance engineer with enough information to draw up a maintenance schedule,” he says. Operating pumps and compressors in particular generate a huge amount of data, which must then be analysed in a time-consuming process. The operator gets the most benefit from this if the data is not just sent to the on-site notification system, but is made available to a cloud platform, together with data from thousands of other pumps. Patterns can then be identified and investigated. Ultimately, artificial intelligence can turn a heap of measured data relating to vibrations, performance and other parameters into reliable predictions: when will which pump sustain what damage? “The endless computing capacity that the Internet is able to harness through outsourced cloud services enables it to provide predictive maintenance better than any on-site control system or application could,” continues Sagebiel. But he qualifies this by saying it is by no means always necessary to have the Internet and artificial intelligence to make process plants more user-friendly and efficient to run. For other plant components such as trace heating, you might simply want to know if it still works, and for this you don’t need to analyse mass data. Monitoring – by measuring current, for instance – is easy; but a failure noticed too late could be catastrophic. If a plant already has full coverage WLAN and performs paperless inspection rounds, it is not far away from taking the next step of introducing augmented reality to assist its fitters. And if this can be combined with a predictive maintenance solution, then the maintenance engineer will not only get support when servicing a pump, but will also be automatically guided to a unit which would eventually fail without his attention. “Big data analysis makes sense when it comes to pumps,” says Sagebiel. “Generally speaking, one should pay particular attention to the rotating equipment that is responsible for 50 to 60% of all unscheduled plant failures. This is true for many plants, but not all. We help our customers to find the right solution for the application in question on their plant, and then to implement it.” He adds that many maintenance teams in large factories spend a great deal of time regularly inspecting all the wells and shafts. Simple solutions can offer an alternative means of continuously monitoring the shaft and report both unauthorised opening and the level within the shaft. “All it takes is one measuring device with a modem and a battery – the staff just have to stop by every six months to change the battery. Even better, personnel will be notified when it is time to carry out this task,” he continues. It is just as easy to monitor, whether hand valves are in the open or closed position. Simple technical solutions are all that are needed to record the end position, based on the NAMUR limit switch, for example. The signal can be transmitted into the control system wirelessly, so errors made by production workers, whether from actuating the valve incorrectly or simply neglecting to enter information in the software, can be avoided. Things become much more complex if a plant operator wants to squeeze maximum availability from valves and positioners, since these provide hundreds of items of diagnostic information that cannot be readily assigned to an ageing process. But there are software tools that can make reliable predictions based on mass data analysis. If the provider of such a tool is granted access to the HART signals of all positioners, the software can warn of leaks or a deteriorating valve lift in good time. A valve app, which each user pays a small fee for, facilitates the scheduling of maintenance work, thus optimising system availability. This could revolutionise how distillation columns are controlled, for example – an issue that has still not been solved satisfactorily. If IT specialists had access to all available variables and disturbance variables, they would be able to create the ideal closed-loop control. All they need are these variables and enough computing capacity. The Proficloud coupler gives them access to both. Any online services the IT experts like can be used on the Internet or intranet. Some new set points are returned, e.g. as Profinet variables or as a recommended action, depending on the application. Taking pump analyses as an example, diagnostic data is fed into the network as big data, and what comes back is something like: “Please replace pump 27 within the next three months.” Anyone choosing Proficloud will benefit from the option to integrate it directly into the Profinet or other networks. is open for open source software, apps and other future technologies. 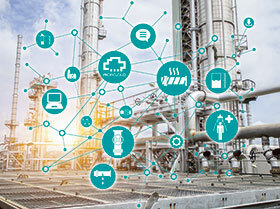 It has intrinsic real-time and fieldbus capabilities, making it suitable for industrial use – one more building block that can help to make brownfield plants fit for the future.